Cosmo. Design hotel in Mid Berlin. You can book it here. Q! Hotel in West Berlin – designed by architects Graft. You can book it here. The Mandala Hotel. 5*design hotel right at Potsdamer Platz. You can book it here. H‘Otello. Comfortable, modern and chic 4* hotel in West Berlin. You can book it here. Schlosshotel im Grunewald. This is a real luxurious 5* getaway. You can book it here. Crackers. The former Cookies Club has been transformed into a restaurant and bar with tasty dishes and nice petrol blue interior. Chipps. For breakfast, lunch or dinner. Also great for vegetarians. Silo. To get brunch in Friedrichshain, try this small Australian coffee place. Kurhaus Korsakow. German dishes and big brunch close to the flee market at Boxhagener Platz. Café Fleury. Charming street cafe close to Rosenthaler Platz. Zur Rose. German food cafe. Café mü. Cute coffee place in Friedrichshain. Frühsammers or Bieberbau: Elegant traditional restaurants in West Berlin. House of Small Wonder. Enchanting coffee place with tasty brunch menu. Try their home-made rolls and Matcha Latte. Grill Royal. Upper class steakhouse right at the river Spree. Thai inside. Colourful Thai food just next to Alexanderplatz. Thaipark. This is a large Thai street food in the park, bring a picnic blanket! Sasaya. Charming Japanese restaurant in Prenzlauer Berg. Omoni. Korean restaurant, also in Prenzlauer Berg. Kushinoya. Japanese barbecue with lots of different skewers. Shiso Burger. Creative burgers with Wagyu patties, sweet potato fries and more. Bye Bye Cavaliere. Tasty pizza slices in Friedrichshain. I Golosi Briganti. Just a street of the Görlitzer Park you can find a small authentic Italian restaurant. Felix. Berlin`s well-known premium club, where movies were filmed and Fashion Week parties celebrated. You can visit concerts with international bands at Huxleys Neue Welt. A cultural must: the Museums‘ Island. You can discover the Pergamonmuseum with its unique Babylonian Ishtar gate, the Alte Nationalgalerie with its famous paintings, the Neues Museum with Egyptian beauty Nofretete and the Altes Museum with its sculptures. Here is an overview of the museums of Berlin. Deutsches Historisches Museum. German history museum with architecture by Chinese architect I.M. Pei. To see sights related to the Second World War visit the Jewish Museum by Daniel Libeskind and the Holocaust Memorial by Peter Eisenman. The Museum Haus am Checkpoint Charly sends you back to when Germany was a divided country. Behind Art Nouveau facades you will find the eight courtyards of Hackesche Höfe – with cinema, shows, stores and food to entertain you. Known as one of the most beautiful plazas of Berlin: Gendarmenmarkt. In winter you can drink your Glühwein on its lively Christmas market. 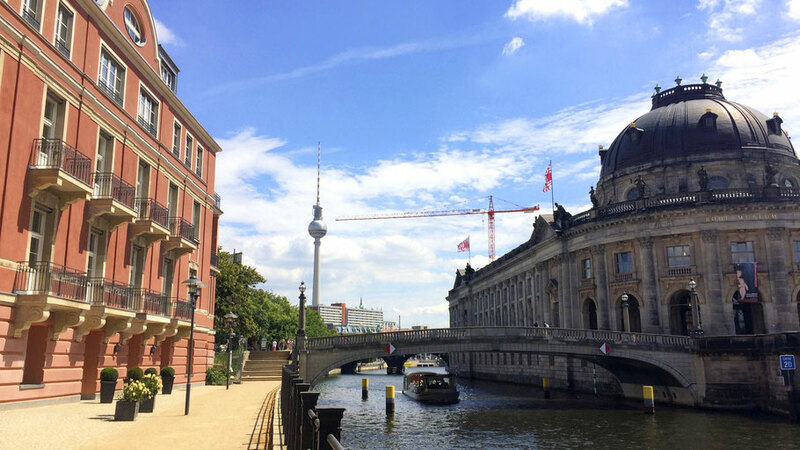 You can take a bus tour with the lines 100 or 200 to cruise through Berlin‘s famous areas – passing by the Brandenburger Tor, Reichstag, Bellevue castle and the International Embassies. How about a trip to Sanssouci Palace in Potsdam? Kadewe. The famous department store at the long Kurfürstendamm. Do visit the 6th floor for culinary specialties or a nice lunch at the Gourmet Bars. For elegant French style shopping you can visit Galeries Lafayette and its food court or Quartier 206. BIKINI. Shopping for selected fashion, design and much more in the renovated building ensemble from 1957. You even have a view on the Berlin Zoo. Thoughtful books and games can be found at the Berlin branch of Alain de Botton‘s School of Life. Berlin has a lot of flee markets. For examples the one on Boxhagener Platz or the books in front of the Humboldt University. There is an overview here.